We stock an array of Ukulele Accessories: Strings, straps, cases, instructional books and DVDs, felt picks, wall hangers. Here are a few featured items. We carry straps support the instrument from underneath and hook into the soundhole. 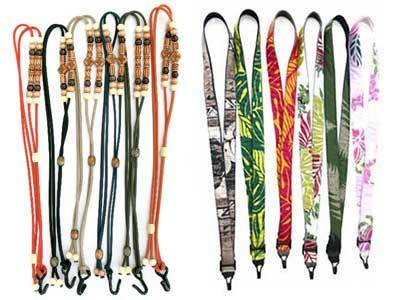 They’re adjustable for length, and are especially suitable for Soprano and Concert Ukuleles. The beaded ones are $15.95, the fabric ones are $21.95. Another option are straps that are primarily designed for mandolin but which we’ve found work quite nicely, especially for larger ukuleles. They’re slimmer than guitar straps and come in a fun array of colors and patterns. You can see our current selection on our Souldier Mandolin Straps page. D’Addario has developed a line of strings in conjunction with popular ukulele string manufacturer Aquila. D’Addario Nyltech strings are designed to produce a warm yet punchy tone. We have them for all ukulele sizes. 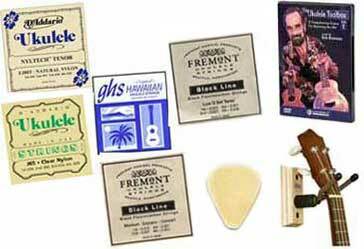 Fremont Ukulele strings are made from fluorocarbon material, which is thinner but denser than standard nylon. These black fluorocarbon strings produce a very clear and crisp tone, very responsive with good projection.We stock standard soprano and concert sets, as well as sets with low G 4th strings for soprano, concert and tenor ukes. We also carry other D’Addario ukulele strings as well as GHS black nylon strings for soprano, concert and tenor ukuleles.